Editor's note: This is the 7th in a series of posts by Dennis Horne, sharing quotes from his book, Determining Doctrine: A Reference Guide for Evaluating Doctrinal Truth. You can read the first post here. The first part of each post is a new introduction, placing the quotes in context with contemporary issues. The quotes that then follow are from the Determinining Doctrine book, which contains many quotes that are not readily available elsewhere or are exclusive to the book. This is one of the most fundamental verities of the gospel; proof is found simply in the fact that the Church and its collective membership has not been led astray and is where it should be. Such assurance does not mean that the prophet is infallible or that he never makes mistakes or that they haven’t believed or taught something that proved erroneous once in a while—a situation more common in the earlier days of the Church than today. While various individuals are too-often lead astray, the Church itself continues operating and growing and spreading across the earth; all under the direction and priesthood keys of the President and Prophet, who moves forward under the direction of Jesus Christ, the Head of the Church. Whether that prophet-president holding the keys of the kingdom be named Thomas S. Monson or Russell M. Nelson or Dallin H. Oaks, or some other now unguessed member of the Twelve, matters nothing. The greatest prophet of this dispensation has so declared: “The truth of God will go forth boldly, nobly, and independent, till it has penetrated every continent, visited every clime, swept every country, and sounded in every ear, till the purposes of God shall be accomplished, and the Great Jehovah shall say the work is done” (History of the Church, 4:540). The Lord Almighty leads this Church, and he will never suffer you to be led astray if you are found doing your duty. You may go home and sleep as sweetly as a babe in his mother’s arms, as to any danger of your leaders leading you astray, for if they should try to do so the Lord would quickly sweep them from the earth. Your leaders are trying to live their religion as far as they are capable of doing so” (Journal of Discourses, 26 vols. 9:289). 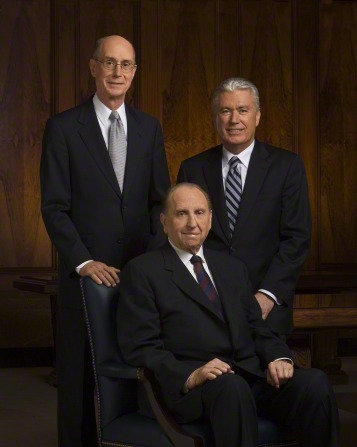 Now, brethren, I think there is one thing which we should have exceedingly clear in our minds, neither the President of the Church, nor the First Presidency, nor the united voice of the First Presidency and the Twelve will ever lead the Saints astray or send forth counsel to the world that is contrary to the mind and will of the Lord. Think of the men who have presided over this church—Joseph Smith gave his life without hesitation, when the time came, but he had finished his work. The men who have succeeded him in the Presidency have possessed divine authority. Each of them in their turn has been criticized. Fault has been found with their ministry, but they have been servants of the Lord and he has recognized them, and they have lived long, useful lives, and have blessed the people…. I make you a promise, my dear brethren, that while I am serving in my present responsibility I will never consent to nor advocate any policy, any program, any doctrine that will be otherwise than beneficial to the membership of this, the Lord’s Church.